Killer R&B stroller - the girls will love this one! Born March 27, 1932 in West Memphis, Arkansas, Herman Parker worked the fields as a lad, picking cotton and plowing. But there was also time for music, whether exercising his vocal cords singing in a gospel quartet or venturing into more secular directions. Amazingly, another future blues harp luminary, the legendary Junior Wells, was one of his West Memphis pals. Later on, Wells would cite Parker as one of his early inspirations. Sonny Boy Williamson #2 (Rice Miller) was Parker’s self-avowed idol. The wily harp wizard gave the talented teenager his initial professional experience in 1948. The two became so closely associated, both professionally and musically, that local fans thought Parker was Williamson’s son and bestowed the nickname of ‘Junior’ on him. Recording in West Memphis in April of ’52, Parker waxed a jumping You’re My Angel and the after-hours Bad Women Bad Whiskey as his debut for the Modern label, backed by a young Ike Ike Turner on piano. Pianist Bill Johnson brought Parker by Sun Records to meet owner Sam Phillips. The harpist was free to sign with Sun. Parker cooked up the rollicking Feelin’ Good during a June 18, 1953 date at 706 Union in Memphis. Phillips summoned Parker back to his little studio in early August of ’53 for their encore session, and they came up with a two-sided gem. Love My Baby was another blistering rocker with a superbly tough guitar intro and solo, while the moodier Mystery Train, titled by Phillips himself, counted off at a less frenetic pace. He sounded assured and polished well beyond his 21 years on the planet. Parker had been touring with Duke/Peacock stars Big Mama Thornton and Johnny Ace, and somewhere down the line hard-boiled Houston entrepreneur Robey convinced Junior to defect from Sun to Duke. Parker wrote both sides of his Duke debut, waxed at his first session on December 2, 1953. Can’t Understand was the up-tempo side. Please Baby Blues, from the same date, constituted half of Parker’s encore offering on Duke. After a bit more than a dozen years under Robey’s control, Parker exited Duke in 1966. He signed with Mercury and veered into more soul-oriented directions. Junior’s first album for the firm was produced by Bobby Robinson—the founder of the Fury and Fire labels. Mercury also shipped Parker off to Chicago and Muscle Shoals for sessions and handed him to Doug Sahm for another studio date. For all that, the major label only managed two relatively insignificant chart items on him, one on the parent logo and the other on its Blue Rock subsidiary. After he left Mercury, Parker’s production was taken over by Sonny Lester, an industry vet. Lester produced Parker for the rest of the harpist’s life, leasing his work to Minit, Capitol, and United Artists as well as releasing some of it on his own Groove Merchant imprint. Little Junior Parker died much too young on November 18, 1971, bringing an abrupt and very unexpected end to a distinguished blues career that should have continued for several more decades. But Junior did a lot of recording in his relatively brief life, as well as a lot of touring and a fair amount of rocking too. As consistently modern a bluesman as he insisted on being—he'd placed his Sonny Boy-influenced harmonica interjections on the back burner to emphasize his smoothly burnished vocals on R&B-styled material—Bobby 'Blue' Bland's Duke labelmate Little Junior Parker wasn't shy about adapting the vintage material of his pre-war blues ancestors to his own considerable strengths. He'd scored a sizeable R&B hit at the end of 1958 by updating Robert Johnson's Sweet Home Chicago, his arrangement echoing a '55 treatment by rotund pianist Roosevelt Sykes. He returned to Sykes' repertoire in early 1961, bringing the Arkansas-born ivories ace's Driving Wheel back for a new listen. 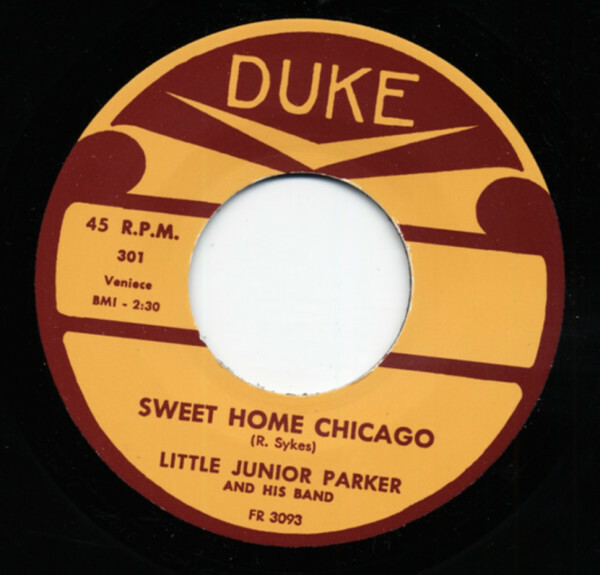 Roosevelt had waxed his original in Chicago for Regal in February of '50, but he didn't have the four-piece horn section that Parker brought to his Houston-cut revival, let alone the gospel-style breakdown Junior breaks into at the two-thirds mark. "Junior could play just about anything that's to be played," says Duke house musician Texas Johnny Brown, probably the lead guitarist on the date (Wayne Bennett is the other possibility; bassist Vernon Heart and drummer Randolph Odom round out the rhythm section). Brown also toured with Junior as his bandleader. "Junior was a good person to work with," Johnny says. "He was kind of happy-go-lucky, but he was business. He had more business sense than Bobby, much more. He was more aware of what he was doing. Bobby was the kind of person that just enjoyed what he was doing, and took the stardom part of it." Duke's two principal breadwinners Parker and Bland toured for "between eight and 10 years" together, according to Bland. "Junior was a good experience for me," says Bobby. "I was his valet and driver. Then I was opening the show. I did all three of the things." They went back even further than that, recording a duet for Modern in 1952. "We were kinda close," says Bobby. "He was from West Memphis, and I was in Memphis. So we used to go on Eighth Street, and play on weekends sometimes. It was our good chance to sit in, or whatever. And so it went on from there. Junior was on the Duke label when I got there." As the decade progressed, Parker dropped the 'Little' from his billing. He stayed with Duke into 1966, then recorded for Mercury and its Blue Rock logo (sometimes in a modern soul style), Minit, and Capitol before dying much too soon on November 18, 1971 in Blue Island, Illinois (a southern Chicago suburb) while undergoing surgery for a brain tumor. Herman Parker, Jr. was only 39 years old. Customer evaluation for "Sweet Home Chicago b-w Sometimes 7inch, 45rpm"